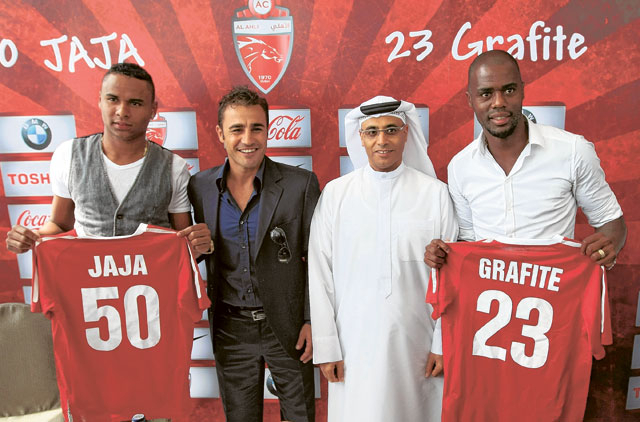 Dubai: Inaugural UFL champions Al Ahli upped the stakes on the domestic football scene when they unveiled their Brazilian duo of Grafite and Jaja before the media at the viewing deck of the Burj Khalifa Sunday. Al Ahli, last crowned champions in 2008-'09, are looking to overturn an indifferent form in all competitions after ending in eighth positions during the previous two seasons. "We are looking at making a solid start next season and that is the reason why we have such quality players this year," Ahmad Khalifa Hamad, CEO, Al Ahli Club, told media yesterday. The 25-year-old Jakson Avelinho Coelho ‘Jaja' has been lured from Turkey's Trabzonspor on a three-year contract, while Edinaldo Batista Libano ‘Grafite', 32, was netted after an amazing season in the German Bundesliga that saw the Brazilian score 59 goals in his 107 appearances with Wolfsburg. Chilean international Luis Jimenez, currently on duty at the Copa America in Argentina, is the third foreign player signed by Al Ahli this season. "I am very happy to be here as it gives me so much of confidence. I want to give my best and score goals like before to ensure the success of this club, just like I did in France and Germany," Grafite said. "Dubai is a safe place and I decided to make the move keeping my family in mind. I have known the coach before and that made things easy for me to come here," he added. "I am very happy to be here and I will try to give my best," Jaja said. "I want to enjoy my time here, and though there are huge expectations here from me, I hope to make everyone happy with my football," he added. "Finishing eighth in the past two seasons is hardly a position for a club of the stature of Al Ahli," added incoming coach Ivan Hasek, who was convinced to give up his position of technical director with the Czech Republic Football Association earlier this month. Hasek, who ironically was the catalyst for the club in their triumph two seasons ago, was grateful for the talent at his disposal this season. "I want to thank the management for bringing in some big name players in the club this season. I am very happy with these players and we agreed to have them with us due to the quality each of them brings along with them," Hasek observed. After being relaunched as the UAE Football League (UFL) in 2008-'09, Al Ahli became the winners of the inaugural edition with just one point more than runners-up Al Jazira. However, they slipped to eighth place the following year and ended in a similar situation at the end of the 2010-'11 edition that also witnessed the mid-season sacking of former Aston Villa coach David O'Leary. "It's really very difficult to compare what we had in 2009 and now," Hasek said. "But with Al Ahli there is more pressure as they are among the biggest clubs with a lot of history. So naturally, the pressure is more," the coach observed. Fabio Cannavaro, who on Saturday was made a global ambassador and technical advisor at Al Ahli, presented the two players with their jerseys.